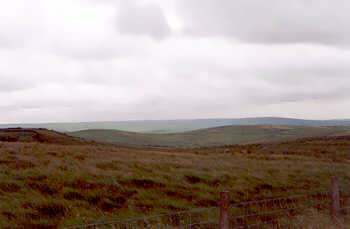 Although not directly associated with the Brontes, the area of Saddleworth (near Oldham) includes moorland and dark millstone grit scenery so typical of the West Yorkshire and East Lancashire Pennines. Deep valleys cut into the bleak and unwelcoming landscape of Saddleworth Moor, just to the south west of where the M62 (Britain's highest motorway) crosses the Pennines - providing a vital link between the cities and towns of the Manchester conurbation (including Oldham and Rochdale) in the west, and Huddersfield, Kirklees and the cities of Bradford and Leeds in the east. The Lancashire side of Saddleworth Moor gained particular notoriety in the early 1960s as being frequented by the child killers Ian Brady and Myra Hindley, and has since then been unfortunately associated with the so called "Moors Murders". Villages in the area include Uppermill, Dobcross, Delph and Denshaw.